BREAKING: IN A MAJOR ANNOUNCEMENT that should affect electric and automated bus and truck production and driveability globally, Daimler has entered into a new partnership with North American electric-bus powerhouse Proterra Inc., it was announced at the 2018 67th IAA Commercial Vehicles show in Hannover, Germany, this morning. The new Proterra deal is reported to be worth up to USD$155 million from investors Daimler, Tao Capital Partners G2VP and others. 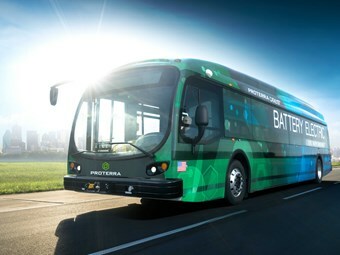 Proterra was founded in 2004 with headquarters in California and is a leader in the business with electric buses for local transport, it’s stated. The deal is reported to be worth up to USD$155 million from investors Daimler, Tao Capital Partners G2VP and others. In an investment move said to underscore commitment to electrification of commercial vehicles, Daimler Board member and head of its Trucks and Buses divisions Martin Daum said: "We started working on electric trucks and buses at a very early stage and we aim to set the standards here in each relevant segment." "We expect the cooperation with Proterra to deliver additional impetus for the development of heavy-duty commercial vehicles with electric drive. In this way, we are broadening our scope in particular concerning the key technology of the battery – also with regard to North America," he added. At the current 2018 IAA event , Daimler is presenting an array of electric vehicles - Mercedes-Benz eCitaro and eActros, FUSO eCanter and E-FUSO Vision One, Thomas Built Buses Jouley - some of which are already in use with customers, the company says. In conjunction with the investment, Proterra and Daimler have entered into an agreement to explore the electrification of select Daimler heavy-duty vehicles. The first of these efforts will be to explore potential synergies with Daimler’s Thomas Built Buses division by bringing Proterra’s proven battery and drive train technologies to the North American school bus market, the next frontier for zero-emission, commercial fleets, it says. Similar to public transit vehicles, school buses provide mission-critical community infrastructure and offer an excellent use case for vehicle electrification, as most school buses travel a predictable distance per day that is well within the capability of Proterra’s EV technology, says Daimler. With this collaboration on an electric vehicle for the school bus market, Daimler and Proterra have the potential to provide reliable, affordable transportation options with environmentally sustainable, zero-emission EV technology, it’s believed. Ryan Popple, Proterra CEO said: "We are excited to collaborate with Daimler, and we appreciate their investment and support. Daimler is a global leader in vehicles that serve almost every category and market. Over the past year, we’ve gained a great deal of respect for the engineering prowess, operational expertise, and environmental stewardship of the Daimler team. We also appreciate the continued support of our existing investors, who share our vision of clean, quiet transportation for all." Nick Pritzker, Chairman of Tao Capital Partners said: "We have made several investments in disruptive transportation companies and believe electric vehicle technology is the future of mass transit fleets. We at Tao are proud to support Proterra in its mission to bring forth a clean, electric transportation ecosystem." The new, all-electric Mercedes-Benz eCitaro also had its trade-fair premiere at the IAA. The new city bus achieves unprecedented energy efficiency thanks to its innovative thermal management, the company says. With a battery capacity of 243kWh and space for up to 88 passengers, the eCitaro is already the ideal vehicle for a considerable proportion of the operations undertaken by city buses today, says Daimler. In just a few years, it will be able to completely replace the combustion engine with unique battery technology and fuel cells as a range extender, it states. The new eCitaro is an integral part of the eMobility system at Daimler Buses. This eMobility system supports transport operators with everything from in-depth advice, an intelligent charging management system and the training of their employees through to the provision of specific services, the company says. According to Daimler, even before the vehicle goes into series production this (European) autumn, orders have been received for several dozen eCitaro buses from customers in Germany and abroad, including Berliner Verkehrsbetriebe, Rhein-Neckar Verkehrsverbund, Hamburger Hochbahn and customers in Norway. The California-based company Proterra is a leader in the design and manufacture of zero-emission heavy-duty buses for local transport, enabling bus fleet operators to significantly reduce operating costs while delivering clean, quiet transportation to local communities across North America, it’s stated. With more than 675 vehicles sold to 90 different municipal, university, airport, federal and commercial transit agencies in 40 American states and Canadian provinces, Proterra is committed to providing state-of-the-art, high-performance vehicles to meet today’s growing market demand, it says. The company’s configurable Catalyst platform is capable of serving the full daily mileage needs of nearly every transit route on a single charge, it’s claimed. Proterra products are designed, engineered and manufactured in America, with offices in Silicon Valley, South Carolina, and Los Angeles.